Are you an innovator? Are you up for a challenge? 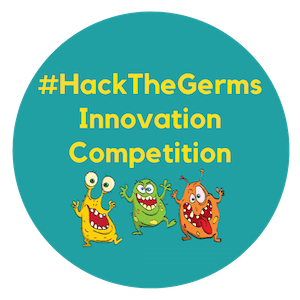 Do you want to have a positive impact on society?Enter the #HackTheGerms innovation competition! 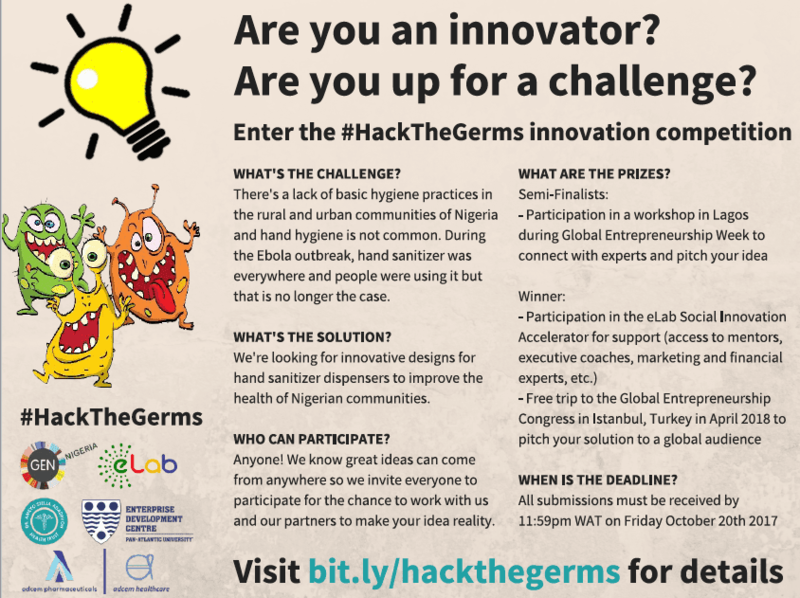 ADCEM Pharmaceuticals, DRASA, the Enterprise Development Centre (EDC) of Pan-Atlantic University, eLab, and the Global Entrepreneurship Network (GEN) Nigeria are looking for innovative designs for community hand sanitizer dispensers. There is a lack of basic hygiene practices in the rural and urban communities of Nigeria. With a population of more than 190 million people and an already overburdened healthcare system, this means that Nigeria is at high risk of infectious disease outbreaks. Hand hygiene is usually only prioritized during outbreaks. For example, during Nigeria’s Ebola outbreak, hand sanitizer was everywhere and people were using it. Unfortunately, that is no longer the case. There is a lack of high-quality, locally-produced hand sanitizers and dispensers for people to use. The goal of this competition is to address the challenge above by developing a dispenser that will ensure ongoing availability and access to hand sanitizer to help reduce the spread of infectious diseases and improve the health of Nigeria’s rural and urban communities. DRASA has partnered with ADCEM Pharmaceuticals and Healthcare to develop locally-manufactured infection control and hygiene products – starting with hand sanitizer that meets international standards. The winning dispenser design will support the distribution of this locally-manufactured product. Anyone! We know great ideas can come from anywhere so we invite all big thinkers, entrepreneurs, students, innovators, inventors, individuals, and problem solvers to share your idea for a chance to make it a reality.